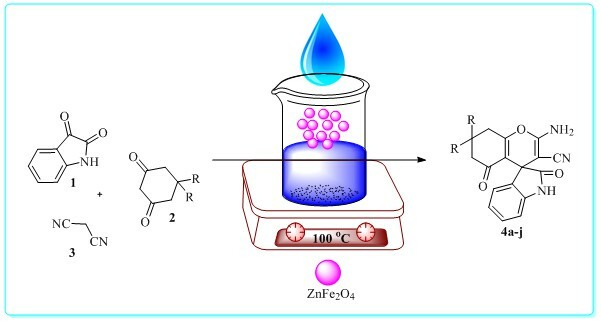 ZnFe2O4 as a novel nanoparticle was prepared and characterized using x-ray diffraction (XRD) analysis, energy dispersive x-ray (EDX), vibrating sample magnetometry (VSM), and fourier-transform infrared (FTIR) spectra. 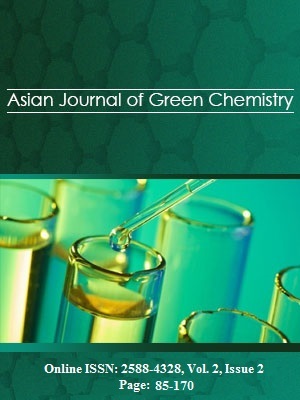 Then, it is used one-pot three-components synthesis of spirooxindole derivatives via condensation of isatin, malononitrile, and 1,3-dicarbonyl compounds (1,3-cyclohexanedione) under mild reaction conditions in water as a green solvent. The present methodology offers several advantages, including ease of the preparation and handling of the catalyst, simple and easy work-up, short reaction times, high yields of the products and recyclability of the catalyst.
. Houlihan W.J., Remers W.A., Brown R.K. Indoles: Part I; Wiley: New York, 1992.
. Sundberg R.J., The Chemistry of Indoles; Academic: New York, 1996.